Scientists reconstruct first hours after a giant impact created one of the largest craters on the moon. Scientists from MIT and elsewhere have reconstructed the extreme collision that created one of the moon’s largest craters, 3.8 billion years ago. The team has retraced the moon’s dramatic response in the first hours following the massive impact, and identified the processes by which large, multi-ring basins can form in the aftermath of such events. The findings, published today in two papers in the journal Science, may shed light on how giant impacts shaped the evolution of the moon, and even life on Earth, shortly after the planets formed. The team’s results pertain to the moon’s Orientale basin, an expansive, bull’s eye-shaped depression on the southwestern edge of the moon, just barely visible from Earth. The basin is surrounded by three concentric rings of rock, the largest one stretching 580 miles across — about three times as wide as the state of Massachusetts. Until now, it’s been unclear how such massive, multi-ring basins materialized. 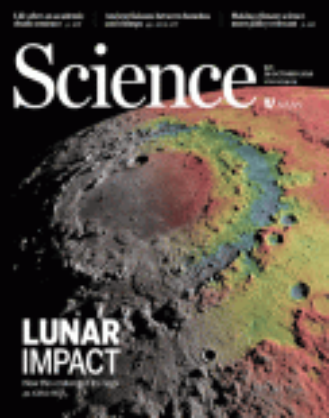 Using data collected by NASA’s Gravity Recovery and Interior Laboratory (GRAIL) mission, the researchers determined that the 3.8-billion-year-old basin was created by a huge impactor that punched an initial, transient crater into the lunar surface, measuring up to 285 miles in diameter — about as wide as the state of New York. This impact, the researchers calculated, sent at least 816,000 cubic miles of pulverized lunar crust flying out from the impact site — an amount equivalent to 135 times the combined volume of the Great Lakes. The ejected material, which the team modeled in computer simulations, rose up like a tidal wave, then crashed down to the lunar surface, creating giant faults through the entire crust and forming two concentric walls of rock on the surface, each rising several kilometers high. Most of the action, according to simulations, occurred over just a couple of hours. If such massive, violent impacts were pummeling the moon, they must have been doing the same, if not more, to the Earth, says Maria Zuber, vice president for research and the E.A. Griswold Professor of Geophysics at MIT. The team’s results are based on gravity field measurements taken by GRAIL’s twin spacecraft, which orbited the moon from January to mid-December in 2012. In the waning days of the mission, the GRAIL probes were programmed to fly over the Orientale basin, dropping their altitude to just 1.2 miles above the basin’s rings — even lower than the altitude at which commercial jets fly over the Earth. Flying so close to the ground, the probes were able to take measurements of the basin’s gravity field at high spatial resolution, providing scientists with a precise map of the moon’s interior mass distribution. Zuber, who directed the mission and led the planning of the probes’ route, notes that the Orientale basin is the best-preserved large impact basin on the moon, having undergone very little transformation since it first formed. For this reason, the basin is considered a relatively pristine example of what the moon and the Earth experienced during a period in which the solar system was dominated by large, catastrophic impacts. In one of two papers in Science, Zuber and her colleagues analyzed GRAIL’s gravity field measurements and were able to solve a key mystery, namely, the size and location of the basin’s transient crater, which is the initial depression created when an asteroid blasts material out from the lunar surface. In smaller impacts, the transient crater is largely preserved. But in very large collisions, the transient crater collapses due to loss of strength in the target crust, erasing any hint of the impactor’s size. In the case of the Orientale basin, many scientists had thought that one of its three rings might represent the transient crater. But the new measurements of the basin’s gravity field show that the transient crater may have been somewhere between the two inner rings, spanning around 200 to 300 miles across. From the size of the transient crater, the team estimated that the initial impact blasted away about 816,000 cubic miles of lunar crust. The gravity signal also showed that two huge faults exist beneath the basin’s two outer rings. In the second paper, led by Brandon Johnson, a former MIT postdoc in Zuber’s group and now an assistant professor at Brown University, the team created a computer simulation to reconstruct the first hours following the initial impact that created the Orientale basin. The team ran the simulation multiple times, with varying conditions, until the final basin and its concentric rings matched the observations made by GRAIL. Based on these simulations, the team estimated that the basin was carved out by a 40-mile-wide object that collided with the moon at about 9 miles per second, or 32,400 miles per hour. The impact pulverized the underlying crust, and the propagation and subsequent unloading of the shockwave caused material to rise up, then crash back down, sloshing back and forth in a wave-like fashion for the next two hours. The material eventually settled back to the surface in the pattern of the basin’s two outermost rings, each rising several kilometers high. This entire process obliterated any trace of the initial crater. The simulations showed that the basin’s innermost ring was formed by a different process. While smaller impacts can cause material in a crater to flow inward, forming a mound in the middle, Orientale’s central mound was so large that it was unstable. The material eventually collapsed, forming the basin’s innermost ring. This research was supported by the NASA Discovery Program. The papers’ authors from MIT include David Smith, Katarina Miljković, and Jason Soderblom. 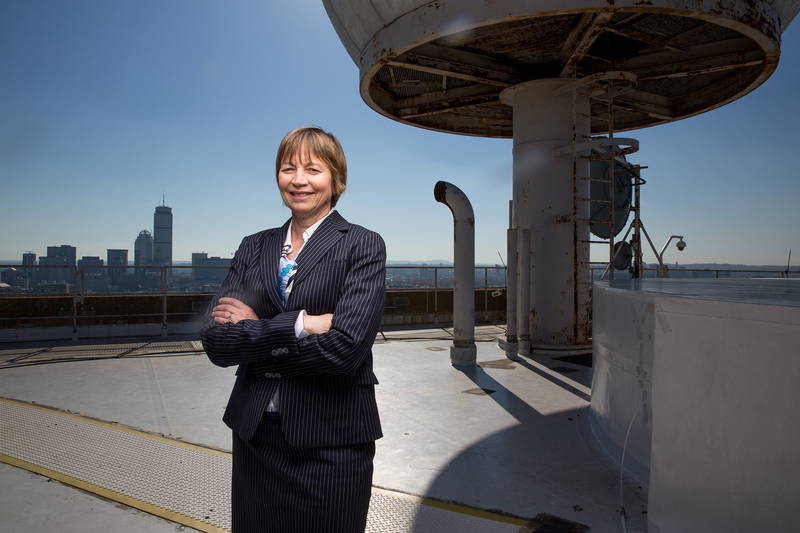 Maria Zuber is the E. A. Griswold Professor of Geophysics and currently serves as Vice President for Research, MIT. Her research focuses on the structure and tectonics of solid solar system objects. She specializes in using gravity and laser altimetry measurements to determine interior structure and evolution and has been involved in more than half a dozen NASA planetary missions aimed at mapping the Moon, Mars, Mercury, as well as several asteroids. She was principal investigator for the Gravity Recovery and Interior Laboratory (GRAIL) and as such became the first woman to lead a NASA spacecraft mission.